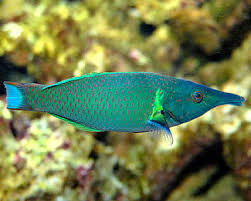 The most unique aspect about the Bird Wrasse is its elongated beak which is used to catch long, skinny prey and hold it captive while breaking it up into bite-size pieces. 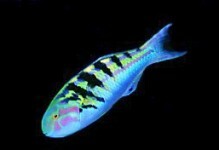 The female is brownish black, and the male is variations of green. 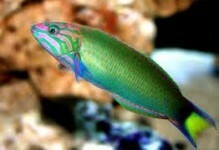 For this reason the male is often called the Green Bird Wrasse, and the female, the Black or Brown Bird Wrasse. A 125 gallon or larger aquarium with large amounts of live rock which furnish food and hiding places provides a good environment. 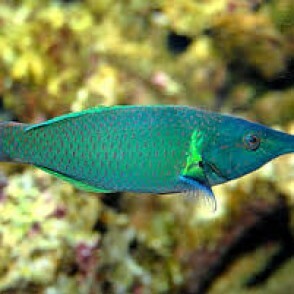 Because the Bird Wrasse is a “jumper,” a tight-fitting lid on the tank is necessary. 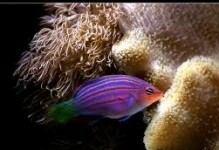 If a pair of Bird Wrasse are to be included in a tank, the female should be introduced first. 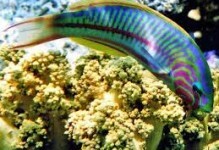 The Bird Wrasse diet should include vitamin enriched frozen mysis shrimp, vitamin enriched frozen brine shrimp, and other meaty foods along with a high quality marine flake and marine pellet food.